Minio Cards are making it easy to collect, share and store life’s precious moments, all in a stylish customizable box. Today, it sometimes seems like our experiences are only as good as the Likes they get on Facebook. If something interesting happens, we’re compelled to share it with our followers. The internet has streamlined our ability to communicate, no question, but sometimes you want to save a memory just for yourself! There are memories and experiences that are too precious to share on social media, but still need sharing (and archiving). If you’re yearning to record those personal moments, log off and open up a box of Minio Cards. Minio Cards are making non-digital cool again with their customizable card boxes. Whether for everyday experiences, special celebrations, or the whole journey, these boxes are a clever way of curating your memories, or the memories of a group! The concept is this: choose a theme and record all sorts of special messages on the provided stationery. A wedding, a retirement party, or a birthday are all perfect occasions for a Minio Card box; collecting thoughts and insights from a group about a particular person or time. Or keep it personal, and rack up the memories to share and keep for yourself. If you’re a serial sticky note composer or an avid doodler, Minio is a great desktop sidekick to chronicle your adventures. 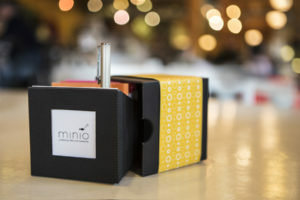 For special occasions, a Minio box makes a heartwarming surprise for the guest of honor; friends and family can jot down their favorite memories, best wishes, and inside jokes. Ever received a hand-written ‘Thank You’ note? It’s way more special than an email or a text message, right? The Minio box takes the sentimental power of the written word to the utmost, letting you relive those valuable memories at your pleasure. This drawer style box made us flip. No, really. A base and lid box is generally designed so the lid lifts up and off on a vertical axis. This design is oriented so the base slides out of the lid horizontally, like a drawer; hence the name ‘drawer style’. Made of 100% recycled chipboard and wrapped in an uncoated beader dyed Rainbow 70 paper from Ecological Fibers. What does that mean? This box is sustainable, made from recycled materials and also recyclable! The box comes in two basic colors; black or white. Thumb cuts at the bottom of the lid allow easy opening. An angled neck tray makes the cards easy to grab. The addition of colorful dividers helps to arrange the contents of the box in an orderly fashion— choose from many colors and words, just one of the ways to curate your customizable box. A removable, reversible bellyband adds an aesthetic kick to the design, and the band comes in several colorful, mesmerizing patterns (another way to personalize your customizable box). A window diecut into the front of the box is suited for labeling each Minio with a respective theme; Wedding, Birthday, Friends, and so on. 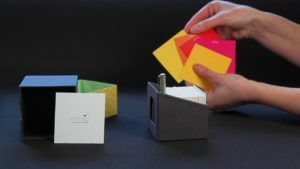 On the interior, a paperboard spacer serves to separate the divider cards from the blank cards, and doubles as a handy pen holster. A number of themed cards are available, like “Bright”, “Soft”, and “Modern”- each with a corresponding color palette. When you get a hold of this box, you won’t want to put it down. The wonderful designer emboss of the wrap makes a Minio Box a tactile delight to handle. The compact design can be stored away with ease, or displayed in your home or office without occupying too much space. Minio Cards are a much needed relief from the hustle of our digital world. At Taylor Box, we often say our work can take on a second life as a keepsake box, but not many projects are designed with the outright purpose of being a keepsake box. We like to think our work will be appreciated and admired for years on, and thanks to Minio, we can count on this customizable box having a meaningful place in the lives of their customers.